Last year, when Margaret Perry approached me about taking part in The Great Katharine Hepburn Blogathon, I jumped at the chance to take a second look at The Rainmaker, a KH film that I’d been eager to re-watch after first discovering/reviewing it in 2012. When I learned that this celebration of Katharine Hepburn would be taking place for a second year, I decided to boldly go where few bloggers have gone before, and defend one of Kate’s least-beloved films. 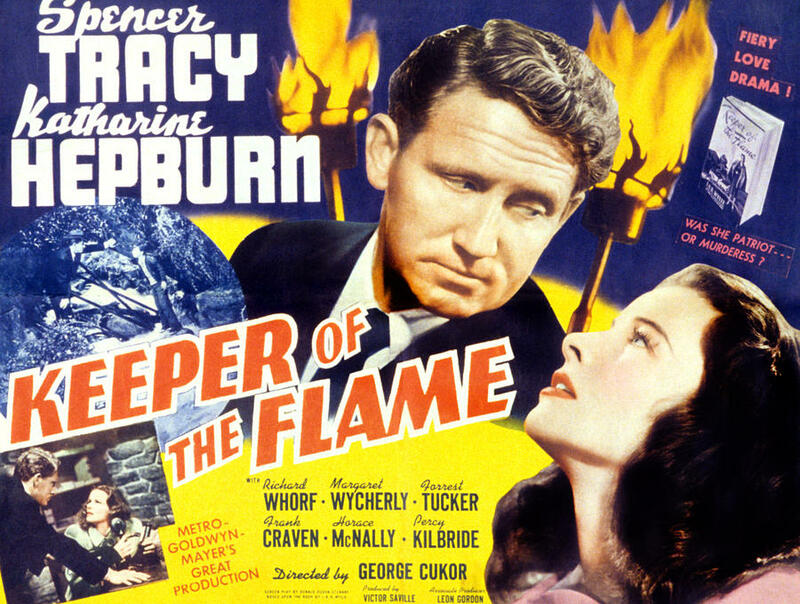 Keeper of the Flame was the second pair-up of the now-legendary Katharine Hepburn/Spencer Tracy screen team. The film tells the story of a journalist (Tracy) who is covering the death of an American political hero, Robert Forrest. In the course of his journalistic digging, he meets Forrest’s widow (Hepburn) and makes a few surprising discoveries about Forrest’s life and death. Very few (if any) Hepburn/Tracy fanatics would rate this mystery-drama as the best film made by the two. A. Scott Berg’s Kate Remembered states that the film’s worth lies in the simple fact that it partnered Hepburn and Tracy up again, rather than in its story or strongly anti-Fascist message. Perhaps my taste in films attracts me to “intriguing oddities,” because Keeper of the Flame was actually one of the first Katharine Hepburn films that I loved. I discovered it when I was in high school, in the early days of my love affair with Turner Classic Movies. I’d only seen a few of her films at that time, and Keeper of the Flame was my first Hepburn/Tracy film. I hadn’t given the film a re-watch in a few years, so I decided to dig out my DVD copy and watch it again for this blogathon. Spencer Tracy is the anchor of the film, playing a hard-working journalist with strong ethical and political convictions. Tracy’s performance is very strong, and he brings some of the film’s most powerful scenes — most notably his conversations with the gatekeeper’s young son Jeb (Darryl Hickman). Kate doesn’t become a major on-screen player in the story until nearly thirty minutes in, though Mrs. Forrest is mentioned almost immediately by the journalists who have converged on the town, filling up local hotels and hoping to get the scoop on the deceased Mr. Forrest. When Mrs. Forrest does finally appear in the flesh, Hepburn adds a lot of intrigue to the film. Her character is mysterious, and a little bit scheme-y. The viewer gets the sense that she’s an unstoppable woman — one with convictions just as strong as those of Tracy’s journalist character, and one who gets things done. Though Mrs. Forrest is a woman who has been living in her husband’s shadow, Hepburn brings a distinct sense of determination and strength to the character. And of course, she and Tracy are great to watch together. Just as much as the lead performances, I appreciate this film for its social commentary, which is highly critical of hero worship (or “hero fever,” as one character in the film describes it) and is unusual for the period. Movies about heroic soldiers, spies, and political crusaders were popular in the 1940s, with World War II casting a great shadow over all aspects of life, including entertainment media. Keeper of the Flame is, instead, a film about questioning the legacy 0f — and revealing the flaws of — a man perceived as an honorable hero. The film doesn’t criticize the country, instead making Forrest a “wolf in sheep’s clothing” character (a secret fascist), but it’s still a pretty unique story. I have to say, I disagree as strongly as ever with the amount of harsh criticism that has been tossed at Keeper of the Flame! It isn’t a perfect film, and the “FIERY LOVE DRAMA!” tagline from the posters may be over-selling it a bit. However, it’s a lot more enjoyable and interesting than most people give it credit for, and its condemnation of blindly supporting/following “heroic” figures is still relevant today. 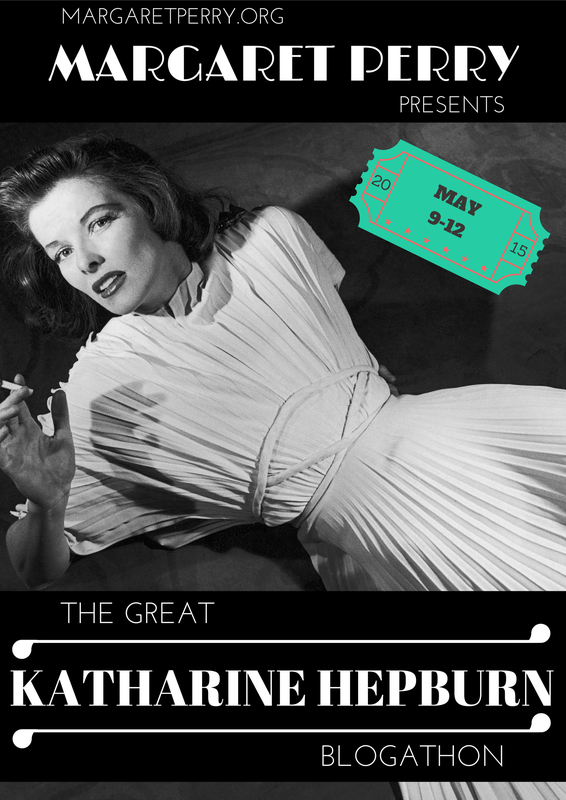 Visit the host’s site, margaretperry.org, for more contributions to the 2015 Great Katharine Hepburn Blogathon! I’ve never seen this film, but I enjoyed your review and your defence of this film. Hepburn and Tracy are always terrific together on screen, even when the script ain’t that great. I hope you enjoy it! Clearly my enjoyment of it puts me in the minority, haha, but I’ll be interested to read your thoughts if you review it! I didn’t like Keeper of the Flame (1942) at all. I thought it was one of the weakest Tracy-Hepburn films. My least favorite is The Sea of Grass (1947) though. Herburn herself said that her serious films with Tracy didn’t work as well as the comedies. That’s why she turned down Tracy’s Edward My Son (1949). After Grass, she made a conscious decision to only make comedies with Tracy. I can see why it’s an unpopular film. I agree that their comedies are much better than their more dramatic pairings. Still, I think ‘Keeper’ is better than most people give it credit for. It has a few powerful scenes, and the performances are far from weak. It’s turned at least one person (me) into a Tracy/Hepburn fan, too, so that’s gotta be worth something! Haha. Totally respect your opinion, though. Thanks for reading and sharing your thoughts! I think you’re right that there aren’t enough stories questioning hero worship–a dangerous tendency at any time. How interesting–and potentially risky!–that this film did so in 42. That makes me want to give it a chance in spite of its flaws. What a thoughtful, interesting review. Hope you enjoy the film if you get around to watching it! Thanks for reading!